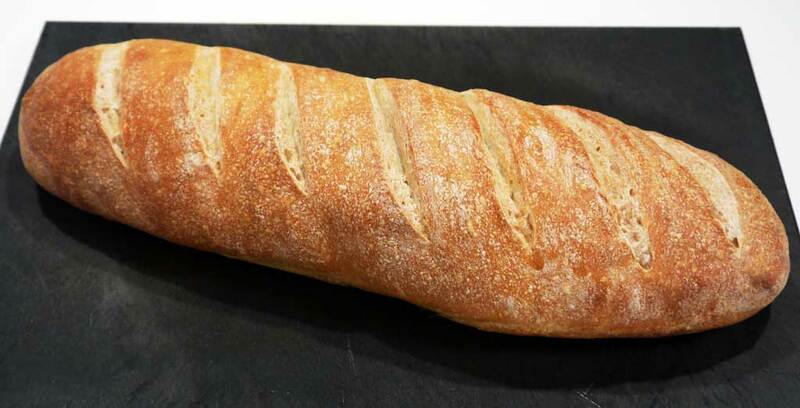 The "French" bread we make most often here in Denmark, is a typical white bread that is quick to make, but taste of very little. It is not a classic long fermented bread recipe, and can have a tendency to taste slightly yeasty. If you want to avoid that, then this recipe is closer to the classic French bread. Slowly fermented and with a pre ferment. It is not really any more difficult to make, but it must be planned a little ahead of time, as there are some long fermentation periods along the way. So for some people it is impractical for everyday use. 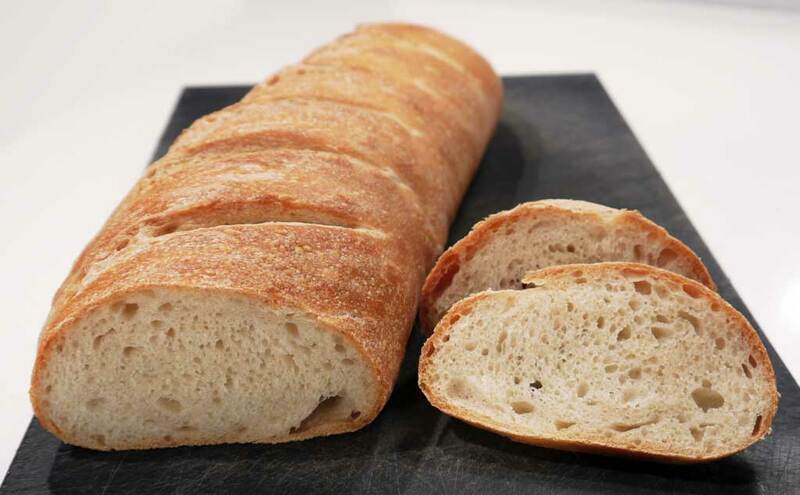 But great for a weekend where you want to make "the ultimate French bread". Weigh all your flour and put it into a bowl. Dissolve the yeast in the bowl of water. Add 3 dl (1 1/3 cup) of the total flour and mix it to the consistency of a "pancake" batter. Let it ferment for 12 hours until you have a thin bubbly pre-ferment. Mix the last flour and the salt into the pre-ferment. Let it raise for approx. 4 hours until doubled in size. Elongate the bread by folding it in half, and loosely clamp it together. Repeat 3-5 times and finish by squeezing it hard together where there is a fold. Roll the bread into a thin log, until it is as long as the roasting pan is wide. Approximately 30-40 cm (12-16 inches). Use as little flour as possible. Just enough that it does not stick to the table or your fingers. Let it rise approximately 2 hours more. Again until doubled in size. Cut the bread with a sharp knife or a bread knife. I usually use a bread knife. Bake for about 35 minutes at 180°C (355°F) convection, or 200°C (390°F) normal. Until the bread is well browned. The difference between this bread and my "classic" french bread recipe is that all the taste comes from only flour and salt. The bread has a much better taste and a slightly more chewy crumb. It is very similar to a mild sourdough. This is why there is such a long fermentation time. This is what creates the taste. Also, there is only a little yeast in the recipe. Such a small amount of yeast does not work well with a relatively dry dough in this recipe. Therefore we need to give it a a kick first, with a wet pre ferment. If 4 hours is too long time when you ferment it, you can add 6 g or 12 g fresh, or 1 or 2 tsp instant, yeast to the sponge just before the final flour is mixed in and kneaded. Then you can ferment it in only an hour or two with good results.